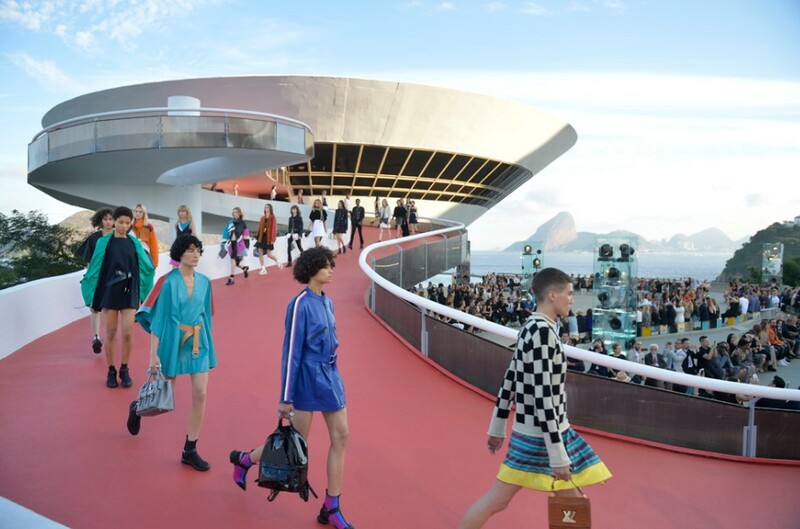 With the entire city hustling over the Olympic Games that are due in the next 65 days, Rio De Janeiro even managed to accommodate Nicolas Ghesquiere’s newest collection for Louis Vuitton. If you’ve been following the brand closely you wouldn’t have missed Ghesquiere’s love for architecture and strong silhouettes that even showed up in his 2016 pre-fall collection. The Niteroi Contemporary Art Museum, designed and constructed by Brazilian architect Oscar Niemeyer, was an apt location that almost resembled a flying saucer. The museum boasts of a concrete spiral that made for a spectacular runway. Without letting the collection lose itself in this grand scheme of things, it is worth mentioning that this was Ghesquiere’s most athletic concept. Streamlined dresses emphasised the new aerodynamic silhouette while embroidered skirts, tech-thongs and neoprene sneakers focussed on the luxurious elements of travel. Pele-inspired prints by artist Aldemir Martins showed up on tank tops, bags shaped like boom boxes were a hit and hot shades of reds and blues mirrored the spirit a of carnival. Zippered mini-dresses, performance-fabrics and athletic gear proved that the Louis Vuitton cruise collection is all about changing the game.